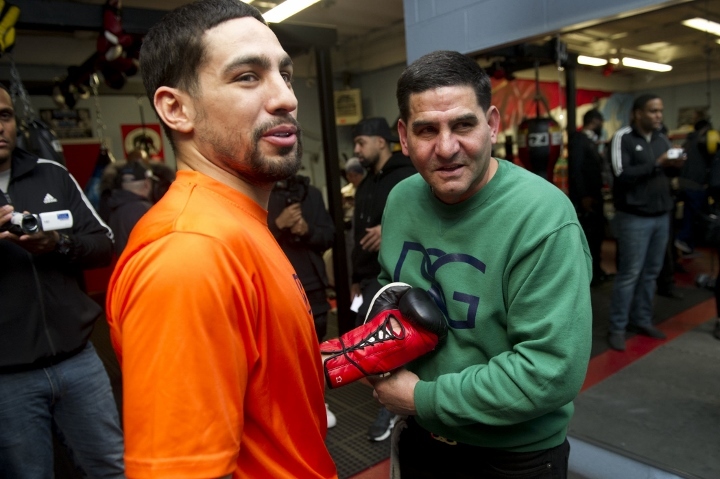 Even when they’re not in the same room—or even the same state—Danny and Angel Garcia remain an inseparable father-and-son duo. The automatic linking of the two largely stems from the elder Garcia constantly making his voice heard and presence felt whenever on site for any given event involving his son. The former two-division titlist flew solo for Tuesday’s press conference in Los Angeles to formally announce his April 20 PBC on Fox headliner with Adrian Granados. Yet among the few questions he was forced to field, arose the subject the balance between father and son. “We are different as far as personalities, but we both have the same heart,” Garcia (34-2, 20KOs) explained of his tight relationship with Angel, who also serves as his head trainer. Father and son will be reunited when Philadelphia-bred Garcia returns to training camp for his bout with Granados, which will take place at Dignity Health Sports Park in Carson, Calif. The bout will be his first since dropping a narrow decision to Shawn Porter in their vacant welterweight title fight last September in Brooklyn, New York. At some point during fight week, Angel will find his way to a microphone–or perhaps even face-to-face with the first person to rub him the wrong way. It’s something to which Garcia has grown accustomed from birth through present day, and which he’s always prepared to diffuse and ultimately defend. “We’re the same type of guy but my father, he sees someone he doesn’t like, he’s (ready to fight),” acknowledges Garcia. “I’m the type that might let it slide a couple of times and then be like, ‘Hey my man, calm down.’ That’s not him; if he thinks you’re an a*****e, he’s gonna call you an a*****e. Me, I’m gonna say it a different way. [QUOTE=el***;19604374]I remember when Angel and ruben were trying to out ******* each other. [/QUOTE] yeah and ruben ended up punking angel and pulled his hoe card. HAHAHAHA!